You want all of your furry friends to have the most comfortable bedding. Even your smallest pets deserve only the best! That’s why we’ve put together this list. Whether you’re just getting started with hamsters or you’ve had them for years, we’re sure you’ll find your new favorite hamster bedding on this list. Before we get started, though, here are some things that you should know about different types of bedding for hamsters. Material: What is it made of? Mostly, bedding for hamsters is made of paper or wood chips. There are even some on this list that is made of help. Absorbent materials are the best for hamsters! Package Size: How big is the package? This refers to the compacted size before it absorbs any moisture. You can use this information to tell what size cage you can fill with a container of the bedding. Odor Control: You’re going to want bedding that has odor control technology, especially if you or someone you live with is sensitive to smells. Hamsters can get smelly sometimes, so this is a great feature for bedding to have. Dust-Free: Dust can make you or your pets a cough or get sick. Some bedding has more dust than others, so make sure that you’re getting bedding that has a manageable level of dust for both you and your pet. Expanded Volume: This refers to the volume of the bedding after it’s been used and absorbed enough moisture. This is the volume that you’ll be dealing with once the bedding needs to be cleaned out and has reached its capacity. Natural: Natural bedding is much better for your pets and the environment. They may feel more secure without synthetic materials and you can be secure knowing that you are disposing of environmentally friendly materials. It’s a great feature! With all of that information, we can now start looking at hamster bedding. Each of the products below is an amazing bedding situation for your favorite small furry friends. Our top pick and budget pick are highlights, and definitely our favorites. Check those out first if you’re pressed for time. Otherwise, take a look at the other amazing bedding options on our list! We know you will find the one that’s perfect for your pets! On top of our list is this paper bedding for hamsters by Small Pet Select. It’s also great for guinea pigs, bunnies, chinchillas, and other small furry friends! It’s a natural bedding that is made of unbleached paper that has never been printed on. In addition, there are no chemical additives at all. We love the idea of giving a hamster natural bedding, and we’re sure that you will too! It’s made in the USA so you know it’s not imported. From the packaged size of 52 liters, it expands 3 times up to 178 liters when it gets wet. So it’s super absorbent, but still comfortable for your smallest companions! It’s the best bedding for dwarf hamsters because it’s soft on their sensitive feet. 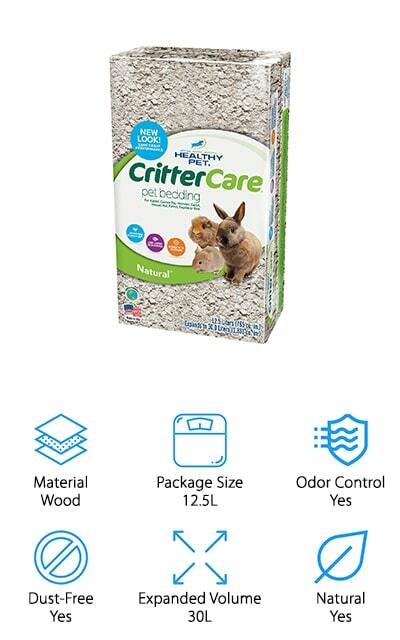 Use it as a pellet bedding alternative, and for bedding when your pet doesn’t like wood shavings. It’s also dust free for sensitive noses! They’ve thought of everything to keep your pet comfortable. 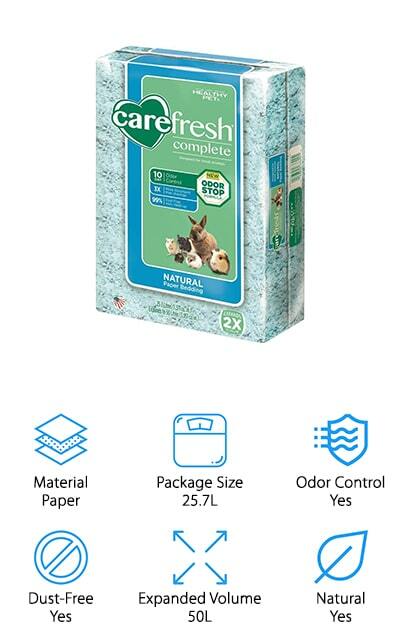 Our affordable option is this Carefresh Complete Pet bedding. It’s a natural paper pet bedding that expands twice its size. You start with 25.7 liters of compacted paper and end up with 50 liters by the time you need to change your hamster’s cage. It’s completely sustainable, made of renewable wood fibers, so you can feel good that your pet’s bedding is environmentally friendly. It’s got dust control features so you won’t have to deal with that when you clean up, as well as a 10-day odor control function to keep your cage smelling great and your pets more comfortable. It’s compostable and biodegradable, which is super important for the environment. It’s a good bedding for hamsters that you can use for all of your other furry friends as well. You are both going to love the way that this bedding works as well as how absorbent it is. The odor control is fabulous as well. 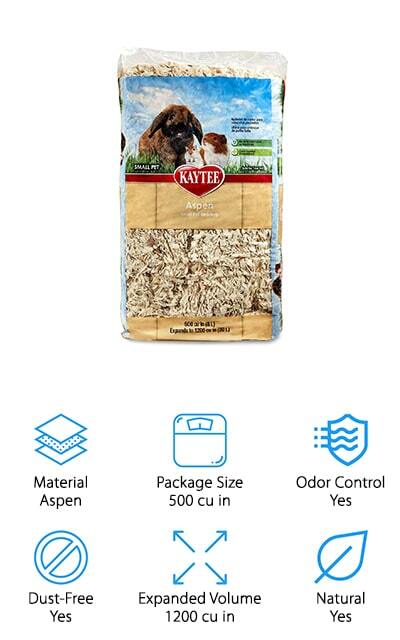 This Aspen Bedding by Kaytee is some of the best bedding for Syrian hamsters because it’s made with hardwood shavings. It’s not made with any oils or inks but still manages to be odor free and to keep both your home and your hamsters’ home smelling great. Aspen is a good hardy wood for shavings. You can use it in aquariums and other places where critters are going to live, and they will be perfectly comfortable! It works to eliminate the dust found in other wood shaving-type beddings because these shavings are specifically processed to keep it down. It expands to nearly three times its packaged size when it absorbs moisture. 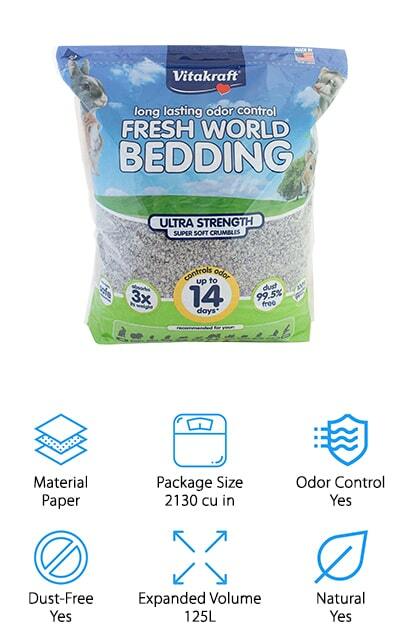 Without all of the dust and wood debris, and with the natural odor-blocking properties, both you and your pet are going to love this bedding. Kaytee has a full range of natural bedding, and we’ll be looking at a few of them later on. Vitakraft’s Fresh World bedding makes our list because it comes packed with a powerful odor blocker that can keep your pets’ cage smelling fresh for up to two weeks. 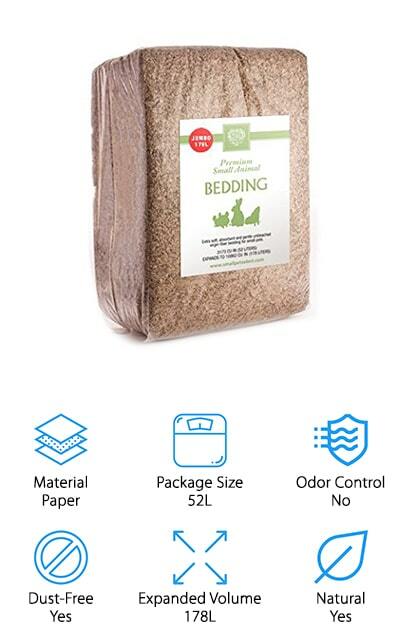 It’s a paper bedding, but instead of being strips or shavings it’s made of soft crumbles, which are more comfortable and inviting. They also absorb three times their weight in liquid. These crumbles are made from recycled paper that hasn’t been bleached and is completely non-toxic. Plus, it’s almost completely dust free, which leads to less mess and less dust. This bedding will make your pet's cage comfortable and easy to clean without spending a bunch of time on it. The formula is completely free of baking soda to keep moisture right where you want it and keeping it perfectly deodorized as well. These recycled, natural crumbles are great for the environment! This hypoallergenic bedding by FiberCore is completely dust free and great for your pets. You can use it for hamsters, of course, but also for rabbits, gerbils, rats, and even birds! The package is about 36 liters in size, though that expands out to 125 liters when you set it out and it absorbs moisture. It’s completely biodegradable and is made with recycled paper so that you can feel great about helping the environment while making your furry friends comfortable. These are paper strips, which means that there is little to no dust associated with spreading them. 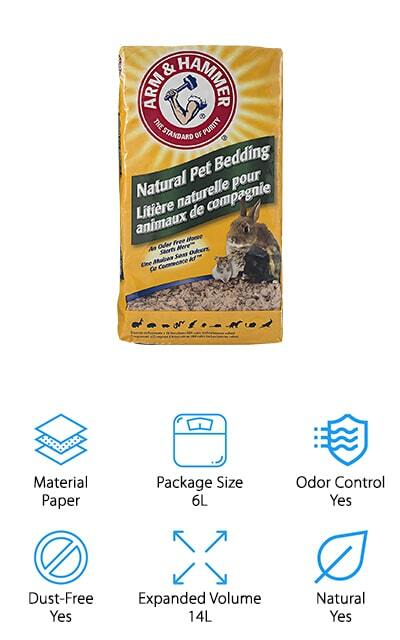 It’s a natural bedding that you and your pets are going to love. It’s great for your nesting pets and will be odor-free for up to a week or more depending on how many hamsters you have. Plus, it’s great for your pets that have respiratory problems, because it won’t irritate them! It’s completely sanitary and non-toxic as well. Healthy Pet makes this great wood bedding for hamsters and other small animals. It’s great for burrowing, so keep that in mind when you purchase - your burrowing animals are going to love it! Like other cedar bedding for hamsters, it works to suppress odors so you don’t have to smell it until it needs to be cleaned. Plus, it funnels moisture away from your pets so they stay dry and cozy. You and your pets will have less respiratory issues because it is virtually dust free. And when you do go to clean it, you can compost it! It’s also biodegradable and made from reclaimed wood pulp, so you can feel secure about your role in the environment. Every piece of bedding an absorbs about three times its weight in liquid, which is neat! If you’re looking to make a switch to a warmer, more natural pet bedding, this is the one to go with! 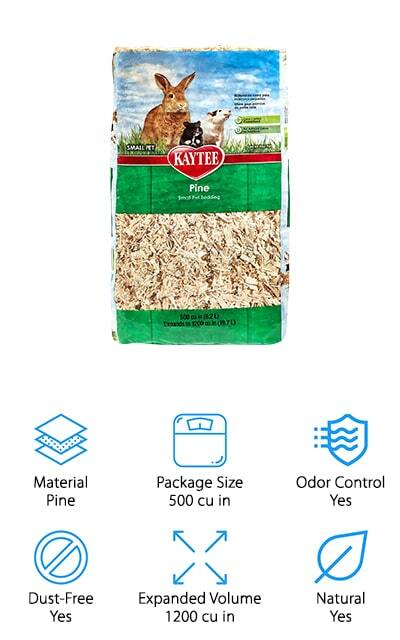 This pine bedding for hamsters by Kaytee is another natural bedding from a great company. They are completely environmentally conscious and biodegradable. 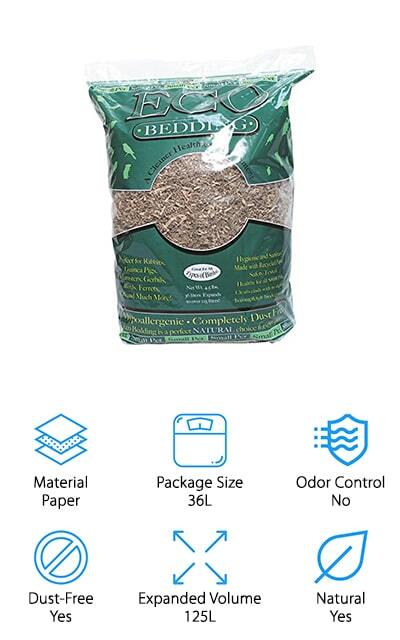 If you compost, you can use this soft wooden bedding as compost when you’re done cleaning it out of your animals’ cage. You can use it in any cage or aquarium that’s open and well-ventilated so that you and your pet get the maximum beneficial effects from using pine bedding. The shavings were specifically processed so that you won’t have any dust or debris from them. In fact, they eliminate up to 99.9% of dust and allergens so that you and your pet can breathe a little easier. We love that this bedding is entirely natural and biodegradable. Plus, because pine is a soft wood it will be gentle on your hamsters’ feet. The pine scent will also get rid of any lingering odors that you don’t want to smell in your home. These aspen shaving by Living World are great for smaller pets with respiratory sensitivities. These shavings can absorb up to four times their weight in moisture, which is great for when you have multiple pets in the same cage. You can use it for ferrets and chinchillas as well as rabbits and gerbils. They work to help inhibit the growth of bacteria, mold, and other fungi as well as providing a clean and cozy bedding for your pets. They stay dry even when the shavings have been absorbing moisture. They love to burrow into these shavings and play in them as well, and they will make your cage cleaning that much easier with how much they catch and keep. 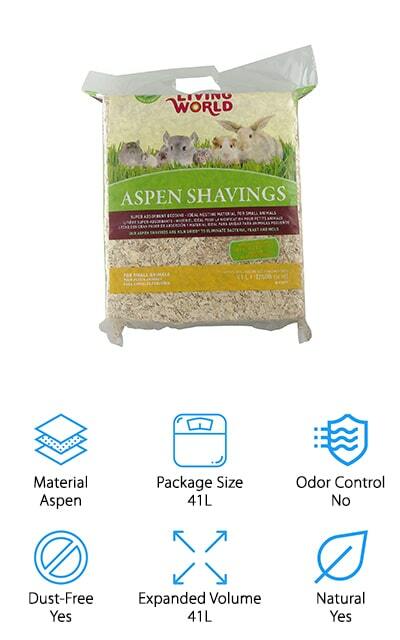 Don’t be fed up with cleaning your hamster’s cage; make it easier on yourself with these super absorbent aspen shavings. Even pets with skin sensitivities won’t be bothered by these shavings. We think that’s pretty amazing! This alternative bedding for hamsters is made with hemp, This means that it’s entirely organic and can be used as compost or in any organic waste disposal system. The hemp smells better than regular pine shavings would and absorbs a ton of moisture. This bag is about 300 liters compressed, which weighs 31 pounds and can be spread over an area of about 50 square feet. Plus, it’s grown without any pesticides or insecticides, which makes it a great natural bedding option. It’s great for horses, chicks, and even cats and chickens. Get the bedding that all of your pets will love! 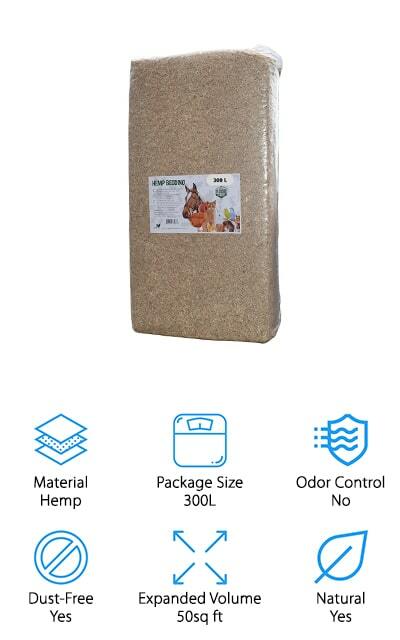 This hemp bedding for hamsters will keep you and your pets happy for a while because it will absorb so much. Plus, it’s really comfortable! We also love that you can use it even with larger animals and livestock, so if you have several smaller cages, this is definitely the way to go! Of course, we had to include Arm & Hammer Paper Bedding, which aims to control massive amounts of odor. You won’t ever smell your hamster or guinea pig cage if you’re using this bedding. It can absorb up to 8 times its weight, so you’re going to get plenty of use of out of it. It’s 99.0% dust free and not made with any toxins, pulp, or sludge. It’s natural hardwood, crystals, and even activated carbon that helps to get the odor out of your pet's cage. It’s also light and soft, so it’s perfect for small paws. Plus, they’re going to love nesting and playing in it! You can’t go wrong with the Arm & Hammer Bedding, because it works so hard to keep your home smelling great and your pet feeling good. You can use it for multiple animals and in cages with many of the same animals as well! We absolutely love this bedding!